For call options, we add in the premium to determine our purchase or sale price. For put options, we subtract the premium to determine our purchase or sale price. As option sellers we are generating monthly cash flow. When selling call options that are then exercised, our sale price will include both the strike price + the option premium. When selling cash-secured puts which are subsequently exercised, our purchase price is the strike price less the premium received from the put sale. Both seminars are free to attend. This week’s Weekly Stock Screen And Watch List has been uploaded to The Blue Collar Investor premium member site and is available for download in the “Reports” section. Look for the report dated 02-06-15. Hi Barry, can you tell me your source for the sector ratings you use for the watch list? Research shows that the industry sector / segment is at least 50% of a stock’s performance. I agree. I want to make sure I only invest in stocks in the top 10-20% of sectors. The A/A rating you use likely equals this requirement (but not sure since I don’t know the source). Also, why don’t you use the IBD industry groups (1-197) and sector rating which is a numeric scale from 1-33? They recommend top 6 which is about the 20th percentile. I note you use IBD to help rate the top stocks for the Watch List. The “Segment Rank” in the Weekly Premium Report is based on IBD’s Industry Group Rank. We take the 197 industry groups and divide them into 5 ranking groups. The groups that are ranked 1-40 are given a rank of “A”, the top 20%. Groups 41-80 are B, 81-120 are C, 121-160 are D, and 161 and over are ranked as E. Note that the lower the rank, the better the score. Since monthly (and weekly) covered call trades are short term by nature, we show the week-to-week movement of the stock’s sector by using two measurements…”X”/”Y”. The X represents the current week ranking and the Y represents the previous week ranking. This way we get a sense of how well the industry/segment is doing on a short term basis. Overall market trend of the market (as defined by a wide range of market reports, macro economic events, economic indicators, and geopolitical events). The specific percentages have been the basis of numerous arguments between economists over the years..
 Stock Specific issues – “Stock Screen” and “Running List” sections. Hi Alan, I wanted to comment on selling weekly call options. Others have brought up this strategy and recommended it. I have been testing this. It feels a little like day trading, but the results have been good to date. I would note that for the volatile momentum stocks that fit the BCI Watch List screens (and the IBD top stocks for that matter), there is a lot of price movement and so the weekly call options seem to fit well. And the premium for the written calls is pretty healthy considering the short period. I am able to find 1% premiums over a one week period for a 4 week 4% return, on strike price 5% OTM. These stocks can move 5% in a week, but not much more (unless there is a special event). This helps lower the chance of getting exercised, as there are only 5 market days for the stock to rise 5%. Selling weeklys is becoming more popular and already implemented by some of our members. There are pros and cons to all approaches. Those who use weeklys may be able to achieve higher annualized returns than monthlys…maybe. You can also use a security up to the week before an earnings report, so 48 weeks a year. On the other hand, we have a smaller pool of stocks to choose from (although growing), lower options liquidity resulting in wider bid-ask spreads, less time for position management, more frequent rolling required and quadruple the commissions. There are lots of ways to make money selling options and using weeklys is certainly one of them. I have signed up for your mailing list and I’ve viewed your educational series and it actually falls right on top of an idea I had before coming across your information. “My” idea was to some how buy stocks and do something with options to some how protect and/or leverage those shares but I hadn’t figured the details. Your process figured out the details for me with one exception. The problem I’m having is finding a single stock that I could buy right now along with selling the equivalent in the money options and actually show a profit not even considering the fees. Maybe I’m picking the wrong stocks so I wonder if you could suggest 1 or more stocks that should work “today”? I appreciate you wanting to sell a service and I’m good with that but I’d like to be able to know for sure things can work before I commit to a reoccurring subscription. What I keep finding when calculating is that once I buy the shares and sell the calls and assuming the shares are called away I’m basically break even or a loss with expenses. Or it seems like I need to buy the stock during a near term dip, wait for the shares to rise a couple of percent and then be able to sell the ITM options. Or do I need to review one of your videos or blogs again? 2- The deeper ITM you go, the more protection you have and the smaller the returns will be so you should look at ITM strikes just below the current market value or the ones that meet your initial goals (mine are 2-4%/month for initial returns). 3- Make sure you are looking at the monthly strikes (I assume from your question that you use monthlys?). Many stocks have weeklys which will show a smaller returns if less time to expiration. If the march $105 strike was sold for NTES, the time value initial profit is 3.3% and the downside protection OF THAT PROFIT is 2.1%. CLICK ON CHART BELOW TO ENLARGE & USE BACK ARROW TO RETURN TO BLOG. Jon, you asked about the stock and option side, but also consider the expense side, i.e., are you paying a reasonable commission? 1) With many brokers you can choose to pay the commission for the options on a per contract basis or on a ticket fee plus a per contract basis. if you’re only doing one or even a few contracts, a per contract commission is almost certainly better. 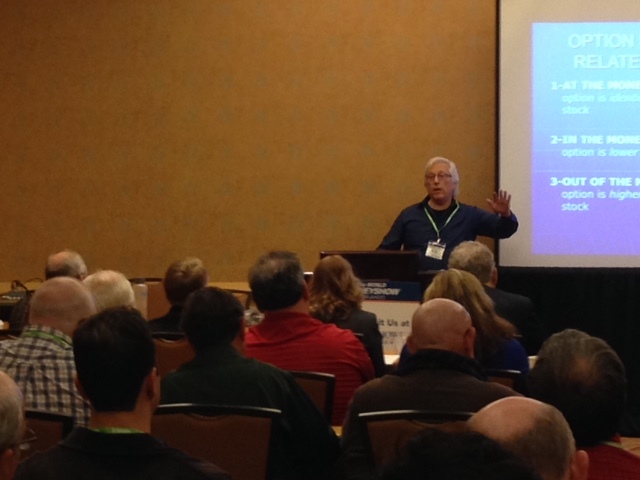 2) Alan’s 10/25/14 blog discusses the commission side of things. The table he lists shows the major published commission rates. Many/most of the larger brokers will negotiate with you for lower rates than those published. Depends on the size of your account and the number of contracts you do per month. 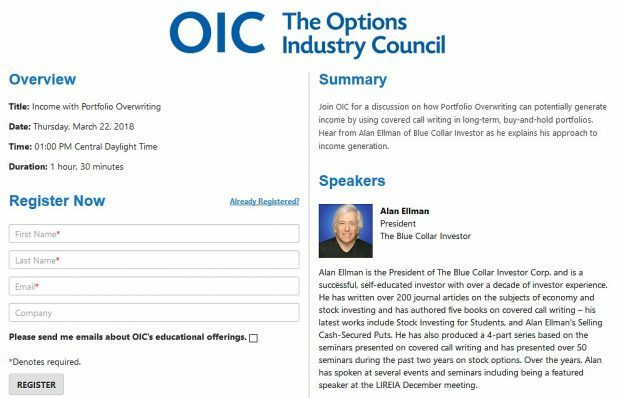 The only low-cost broker that I’m aware that’s not in Alan’s table is eOption. They are the lowest but with some functionality trade-offs. 3) As a beginner, paper trade paper trade paper trade. Until you understand how to do all of Alan’s adjustments in an up, down or sideways moving ticker, don’t risk real money. And place a LOT of trades, i.e., dozens every week, and put them all in a trading journal. Doing a lot of trades will get your experience level up very quickly. Using a journal allows you to study what happened. Plus, the more you do the more the statistical odds are likely to work out. I want to start by thanking you for your excellent, clear & concise videos. They’re the best I’ve seen so thanks for sharing. Really appreciated. The series I watched was all about covered calls. I notice an email link is about puts. Any reason for the change? Also wondering about the mechanics of a covered call. As a seller of the call, I understand I’m guaranteed the premium (or am I?). When things are going in favor of the buyers position, is his profit going to come from me HAVING to give up the shares to the broker if the buyer closes his profitable position WITHOUT taking ownership of my shares or how does that work? Am I as a writer attached to a unique buyer or am I just dealing with a pool of contracts in the series I’m selling? My apologies for the lengthy email. I’m really hoping you can clarify this for me. Thank you so much for your time & effort. 1- Covered call writing and selling cash-secured puts are similar strategies, both appealing to conservative retail investors (I’m guilty as charged). Our members have been asking for more information on put-selling and so we responded with the recent publication of my 5th book. Much more to come with both strategies and more strategies in the future. 2- Your premium is guaranteed, yes. 3- Most call option buyers are expecting share appreciation. If that does take place, most will simply sell the option at a profit. Those who exercise will do so when the strike is below market value at expiration. We as cc writers can prevent that from occurring if we choose to. 4- Our options go into a pool managed by the Options Clearing Corporation which matches up buyers and sellers. I read your book but do not know what to do. Had WFC stock in my acount. On jan 6 sold a 52.5 call for 2.9 premium to expire 17 July. Now premium 3.95. The covereď call was doing great and I do not wish to sell the stock. I want to buy back the sold call. But when? Any chance that the premium will go down again? Should I buy baçk the option? Thx for your expert reply. To figure out whether to buy back the option, we must look at the trade through the eyes of the option holder (buyer). Will he exercise early? The $3.95 option premium you mentioned in your question consists of time value + intrinsic value (the amount the $52.50 strike is in–the-money). If the option holder exercises, he captures intrinsic value and loses the time value. If he sells the options, he captures both. A rare exception would be related to a dividend and the ex-dividend date comes up before contract expiration. This will rarely occur when expiration is months away. Soooo…it is highly unlikely that your shares will be assigned (sold) early. The most likely time for assignment is the day after expiration Friday. Option value sure can go down. Time to expiration, option volatility and share price will impact option value on a daily basis. Hi Alan, I would add an insight that I acquired through hard experience and that I am sure you know. Writing calls on very large and low volatility stocks or ETFs is not very rewarding unless one goes out several months like Shelley did (July). But going out so many months ties one’s hands and caps upside. There is also the matter of the most time decay as a percent of strike price is nearest expiration (theta). This may be reasons you recommend going out one month as ideal. It also accounts for the mostly smaller cap (than WFC) and higher volatility stocks on the Watch List. I know you are a very busy person, but perhaps when you have a minute or two, you might elaborate a little on why do you “still give a slight edge to covered call writing in normal and bull market environments”. Most probably you’ve mentioned it in your materials, but I fail to recall it. I understand it’s your opinion only, and I’ll receive it as such, but it would be very interesting to know it. Covered call writing allows us to enhance returns via share appreciation when writing out-of-the-money calls. This is particularly useful in favorable market conditions. When selling puts, our max return is the put premium. Now we can enhance put premiums by selling in-the-money put strikes but that will increase the chance of assignment which is what most put-sellers are trying to avoid. As a result I lean to cc writing in normal and bull market environments although we should succeed with both strategies in all market environments (except aberrations like 2008) once the techniques are mastered. In an effort to maintain, to the extent possible, my desired relative asset classification allocations in what essentially then becomes an index-based buy & hold Portfolio, I treat a significant portion of my total Portfolio separately, & to gain some small increment of additional gain on that portion, my Covered Call activity within it becomes pretty much an exercise in Portfolio Overwriting. My question is, under those circumstances, would the application of your 20/10 Exit Strategy still be appropriate to use as a guideline in managing the contracts in an ongoing fashion? Absolutely. Buying back the original option and retaining 80% – 90% of the original premium, now puts us in a position to sell another option, either the same strike (“hitting a double”) or a lower strike (rolling down). Because you are portfolio overwriting, selling the stock is not a consideration. Blue Collar Investor premium member site and is available for download in the “Reports” section. Look for the report dated 02/06/15-REVA. The Open Interest data has been revised and page numbering in each section has been added. Alan, I know this is a bit off-topic. Since I am a new premium member, I have been reading your prior blogs going back quite some time. It seems you relied quite heavily on the Scouter Report in doing your weekly evaluations. I understand there has been a recent problem getting Scouter Report data. How has this impacted you evaluation process? Are you using an equivilent report or has the Scouter Report been rerinstituted? 1- As a premium member, you are receiving Scouter data…it’s the risk/reward column on pages 2-4 of our weekly stock reports. 2- Because we use a mosaic of several fundamental, technical and common sense screens we do NOT rely on any one screen. Even without the Scouter data our screens will result in outstanding candidates. Please note that in all my material, I say that ADRs (American depository receipts) which never had Scouter data are still eligible if they passed all other screens. We have been in touch with the company that developed the algorithm for the Stock Scouter. We are told it will re-appear in some venue yet to be determined. In the interim, we’ve been able to access monthly Scouter stats that we have included in our current weekly premium reports. In the interim, for those who are not premium members, we suggest decreasing risk by using low-beta stocks (below 1.5 at least) and favor ITM strikes in questionable market environments. Remember that our stock selection is based on a series of screens in multiple areas so no one screen will make a major difference. Therefore, even without the Scouter, the selections will be high-quality choices. I am also working on an alternative risk screen should the Scouter not become available in the future (unlikely) and that will be information I will share with both premium and general members. For now, using all other BCI screens will still result in elite-performers.